If there is a country that loves grilling more than Turkey does, I don't know it. This is a population that stows barbecues in the trunks of cars, ready to be stoked up -- in a park or a parking lot, on a hill, by a river or a roadside, even on a traffic median -- at a moment's notice. In winter of 2012 we passed a group hunkered in a snowdrift by the freeway breakdown lane on Ankara's outskirts. As a middle-aged woman skewered meat, her (presumably) husband fanned the grill's flames. The thermometer on our dashboard read 1C. "Neither rain, nor sleet, nor snow ...." The old saw about the American postman would apply to the Turkish griller, if it also included a reference to Hades-like heat. Such were the weather conditions at the beginning of last week in Diyarbakir [dee-YAHR-bah-ker], in Turkey's inland southeast, where the skies were cloudless and daytime temperatures hovered around 41C (106F). Night brought little relief. After several hours wandering the city's old section the last thing I wanted to do was sit in the smoke path of a flaming grill. But in Diyarbakir the night belongs to the izgara usta (BBQ master). After dusk it's near impossible to walk a block without bumping into a wheeled cart belching meaty smoke. We were there to sample local specialties, and grilled anything -- liver especially -- is one. So we gave in and selected a mobile operation that came with tables and proper seating -- banquettes with backs and cushions, no less! -- set not street-side, but in the street. This was no Penang-style barebones street food operation. The grill anchoring one end of the cart was big, with room for at least twenty skewers laid side by side. At the other end a refrigerated case displayed liver, heart, gizzard, neck, kidney, chicken wings and chunks of beef and lamb and chicken breast, all skewered, seasoned, and ready to char. We placed our order (chicken wings, beef chunks, lamb liver) and sat. The usta's helpers layed before us the fixings of a feast: roasted whole small onions and long thin green peppers, sliced tomatoes and fresh onion, two plates of coban salatasi (chopped tomato-onion-cucumber-parsley salad) and a platter heaped with fresh rocket leaves with wedges of lemon for squeezing. We raised a hand to the teenager tending a nearby ayran cart, and soon we held glasses of ice-cold salted yogurt thinned with water and seasoned with fresh herbs. Soon the guests of honor arrived, each kebap on a separate platter, another piled with thin flatbreads. The beef was smoky and surprisingly tender and the chicken wings, seasoned with nothing other than salt and pepper, were deeply browned and crackly-skinned with moist flesh that fell off the bones. To be honest the liver was a bit on the dry side, despite the fact that our usta had skewered it between chunks of lamb fat (a common technique). There are probably better liver kebapci in Diyarbakir. But I was happy enough to eat my fair share, and I'm not what you'd call an offal obsessive. We ate our kebaps as rolled sandwiches, using our flatbreads to slide the meat off its skewers and then adding salad, a bit of onion and green pepper (the latter surprisingly spicy), a few leaves of rocket, a squeeze of lemon, relishing every bite as sweat ran in rivulets down our backs. I've never been much of a liver lover, but that kebap turned me. Was it the liver? Or was it Diyarbakir itself, a city that confounded, challenged and intrigued me all at the same time. I'll return, and I'll order liver kebab again, too. But not till autumn, after the mercury falls. The grilled kebab capital of Turkey may well be Gaziantep, a great eating city some 3 hours (by car) south of Diyarbakir. Dave spent a few days there in March, shooting a story on grilling for the June-July 2013 issue of Saveur magazine. 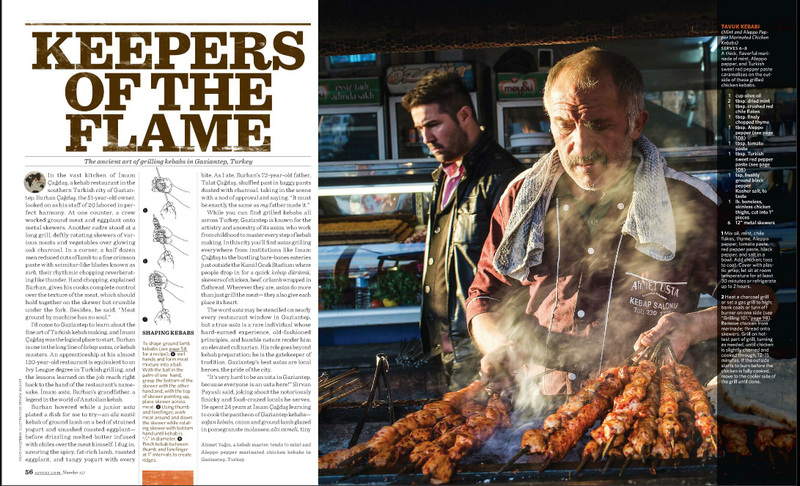 He shares portraits of Gaziantep's grill masters, and mouthwatering photographs of their specialties, here. Broiling down in Texas too. We didn't try the liver kebabs. I grew up as a child with liver in our cajun diets but never cared for it very much. Have a wonderful time in Turkey! Thanks Sarah. We're already back in Penang, but we'll be in Turkey, and Diyarbakir again this fall. Got a bit of the type of heat you're having when I was in New Mexico a couple weeks ago. With smoke/haze from brush/forest fires to boot. Not fun.